It was a simple search that led me to begin an automotive air conditioning bulletin board. If you have ever searched for something on the Internet and then found yourself overloaded with information, consider yourself lucky. Trust me; I remember the way it used to be. My search started about ten years ago. It was 1995 and I was looking for an alternative supplier of ultraviolet dye. Back then, I could only purchase this modern marvel at a few supply houses. The vials were small and the prices were high. My quest for a more economical solution led me to the Internet. After hours of wading through search engines—with that slow dial-up connection—I turned up little more than what I started with. In fact, I found only two sites that even discussed automotive air conditioning. This was just the excuse I needed to start Aircondition.Com. Heck, I would have virtually no competition in this endeavor, and I was sure that I could provide more information than what was currently available on-line. 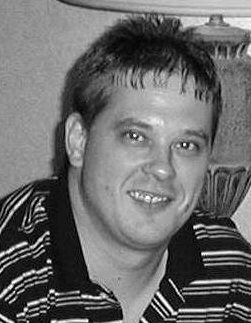 Since I was an A/C installer, my hope was to attract about thirty-five other installers and harness the power of networking to share tips and tricks of our trade. I envisioned a base where installers across the country would meet to swap electrical diagrams and discuss aftermarket air conditioning installation for the good of all mankind. That was the plan, but it didn't work out that way. The trend that emerged was not what I expected. Early on, around spring of 1996, I began receiving electronic mail messages from do-it-yourselfers requesting advice for a wide variety of automotive air conditioning problems. At first, I thought this was great. What started as dozens of e-mails became hundreds. After weeks of staying up late to keep up with all the pleas for help, I decided it was time to put up an Electronic Bulletin Board. Suddenly, my original goal to attract thirty-five installers across the United States was placed on hold. It would go no further until I could find a way to match the questions coming from people around the world to the people who had the answers (and were willing to share them). 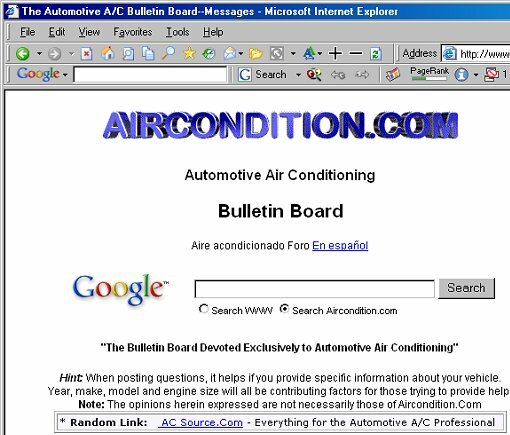 That was the birth of the Automotive Air Conditioning Bulletin Board as I know it. Sure, there were Newsgroups in place that were already well established to handle this type of messaging. But, Usenet was not considered part of the easy-to-navigate World Wide Web. I felt it was somewhat obscure to the average Net newcomer. More than 12,000 visits per day! That moment came to me as a big surprise, and from that point I began looking for my Site to be featured in other print media. I was very pleased to see it appear favorably in many popular magazines. By 1998, the unique visitor count exceeded well over twelve thousand people per day, with the bulletin board receiving the majority of that traffic. So in the end, did I attract the thirty-five installers like I had originally planned? Yes and no. While I wasn't able to attract 35 individual installers, I did have the good fortune to run into Ignacio Corella. For anyone who doesn't know Ignacio (Nacho, as he is affectionately known as), you'll find his articles in Cool Profits Magazine (or you can read thousands of his messages on the old Aircondition.Com bulletin board). If you know Nacho, then you know he is really the equivalent of thirty-five installers wrapped up in one. He was one of the first contributors to the air conditioning board and continues to be a great source of information to this very day. I finally retired the Aircondition.Com bulletin board and passed my torch to Warren Willingham of Acsource.Com. But on June 28, 2005, during one final act of revenge, I logged into the servers at ACSource and gave Nacho the official duty of Moderator for the new board: Tag Nacho, You're it! If you’re actively involved with mobile air conditioning, and you haven't already done so, take a few minutes and check out some of the discussion boards that are on the Net. There are now quite a few that cater strictly to automotive air conditioning questions and answers. Unlike the searches of yesteryear, all the information is at your fingertips. If you have a question, one of these kind people, from somewhere in the world, will have the answer. As for me, after almost ten years from my original search, I quit looking for that ultraviolet dye; managing the web site kept me too busy. Here's the link to the subscription page for the Print version of Cool Profit$ Magazine. 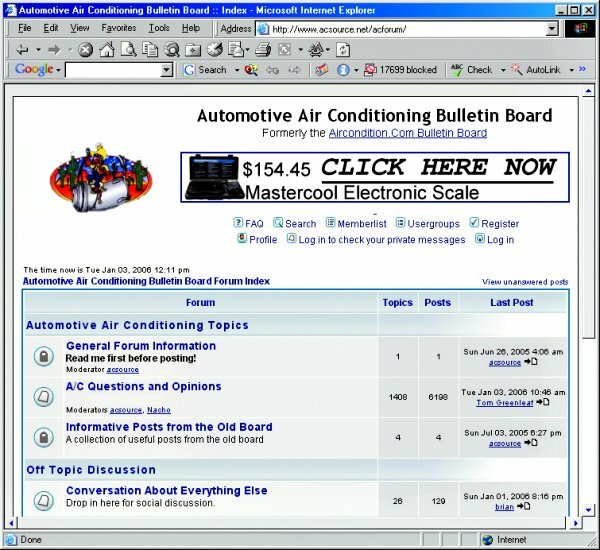 Hundreds of thousands pages of A/C questions and answers were generated by vehicle owners and technicians on this 10 year old A/C Bulletin Board website. Quite a feat! Well guys, after many years, several server changes, lots of great conversation and the opportunity to meet some of the best people, I'm ready to call it quits on this old outdated bulletin board. It has been used (and even abused) for way too long, and now it's time to retire it. I asked Warren from acsource.com if he would be willing to lend the resources to keep the torch going. Warren told me that he had plenty of bandwidth and would be happy to do it. We start fresh with a modern board that's full of the nice features like personal message boxes, post preview, avatar uploading, editing, etc. It's very slick compared to what Aircondition.Com has. I hope our long time friend, Ignacio (Nacho) will agree to help moderate the board. Especially since I just set him up as moderator :-) I'll be around in some capacity for a while to help admin since Warren is down with a bum knee. As for this board, it will no longer accept any new threads, but I'll be keeping it up for a few days so people can still respond to some of the recent posts. The address for the New board is http://forum.acsource.net You'll have to register, but it only takes a few minutes at the most. I'll be excited to see all you guys there!